Bob and I were hiking along a small creek called Duffin’s Creek, in Markham, Ontario. As the sun was sinking lower and time was getting on, we were making our way back towards the trailhead when Bob’s eye suddenly registered an usual silhouette in a tree when he glanced to the right. There sat a Barred Owl that had seen us coming. Slightly smaller than a Great Horned Owl, a Barred Owl has a well-developed facial disk with dark eyes. 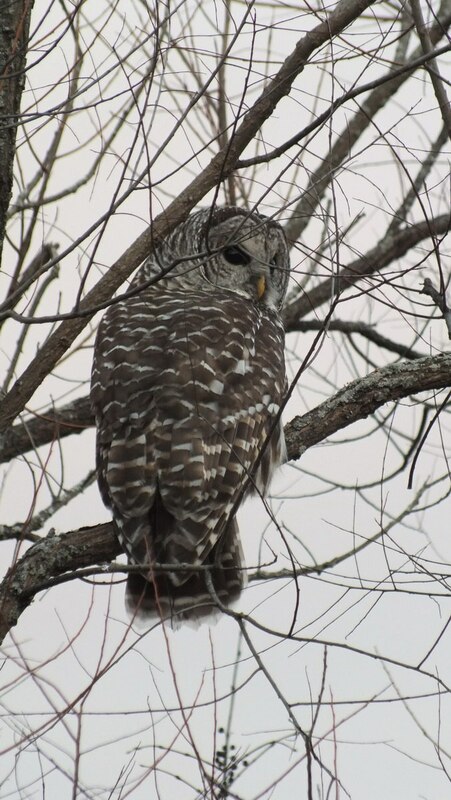 Barred Owls are very common in the United States and central and northern Ontario, however they are extremely rare in parts of southwestern Ontario. According to Bird Studies Canada, Barred Owls are elusive birds making them difficult to actually sight and observe. Barred Owls like to eat small mammals like squirrels, mice and rabbits, and even, on occasion, they will eat other birds like grouse. In the area where we first spotted the Barred Owl, corncobs from the nearby cornfield littered the forest floor, so I’m sure an abundance of rodents have provided a good hunting ground for the owl. 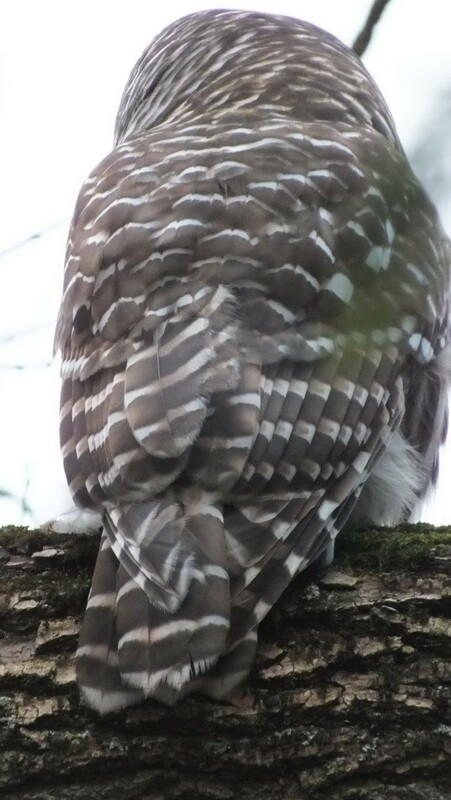 Barred Owls are gray-brown in color, with a round head and NO ear tufts. Adults tend to be around 43-50 cms in size. To the west, the sun was setting quickly. 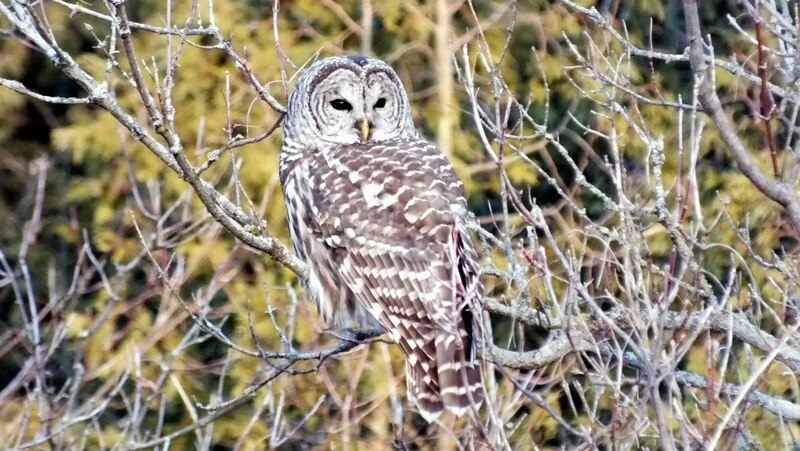 This sighting was the first time we had ever seen a Barred Owl in its natural habitat, and only the second time that I had observed any wild owl. It was the perfect ending to our otherwise uneventful hike. thanks, Kylie. 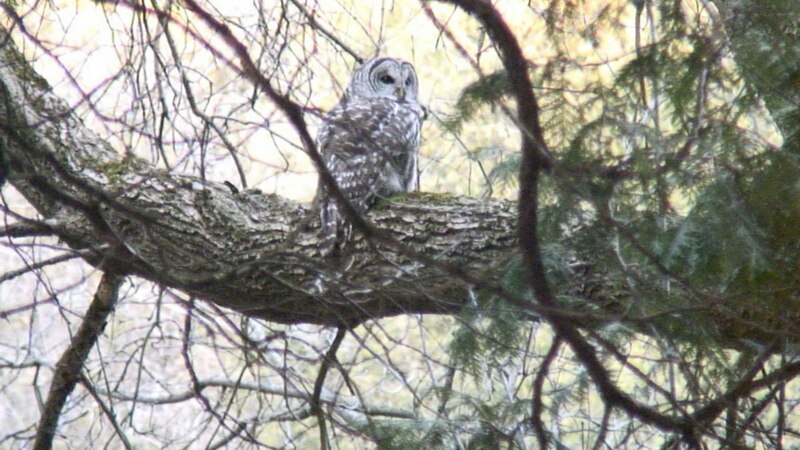 The Barred Owl we spotted that day was only the second owl we had ever seen in the wild. We wanted to show the location and conditions as well as the owl itself. Thanks for looking. 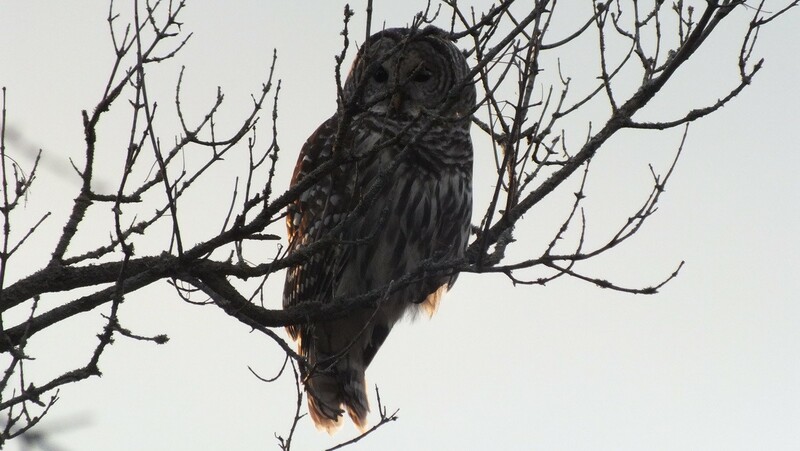 Bob and I have been following bird sightings over the course of the past few months, and it does seem that Barred Owls are very common visitors to nature reserves and even peoples’ backyards. Did you know that, in British Columbia, a cull has been proposed of the Barred Owls to help save the Northern Spotted Owls? They must be very numerous in that province. Bob and I have hiked Milne Park for years, albeit with our dog for many of those, so I am sure that is why wildlife sightings eluded us then. However, now that we go it alone, our hikes in Rouge and Milne Parks have proved just how diverse is the wildlife in our urban locale. Good luck on future outings. Thanx for the shots and story! It may be worth it to go back to try and find his nest. Any local clubs that are aware of it? Thanks for your comments, Bruce. 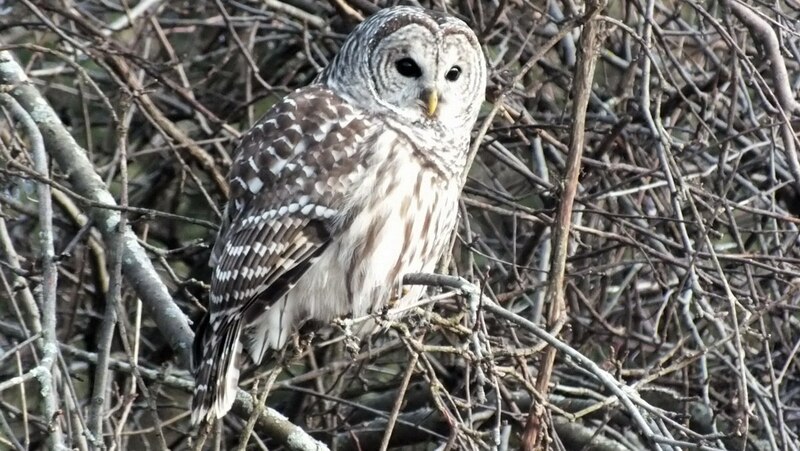 We haven’t had a chance to go back to that location in search of the Barred Owl, but we did come across another one at Thickson’s Woods in Whitby a few weeks ago. Your pictures of the owl devouring the vole were awesome! You were so lucky to be there at the right moment. Wow, wow, wow!! What beautiful pictures of an exquisite bird!! :)) And to think you saw it in the Toronto area. 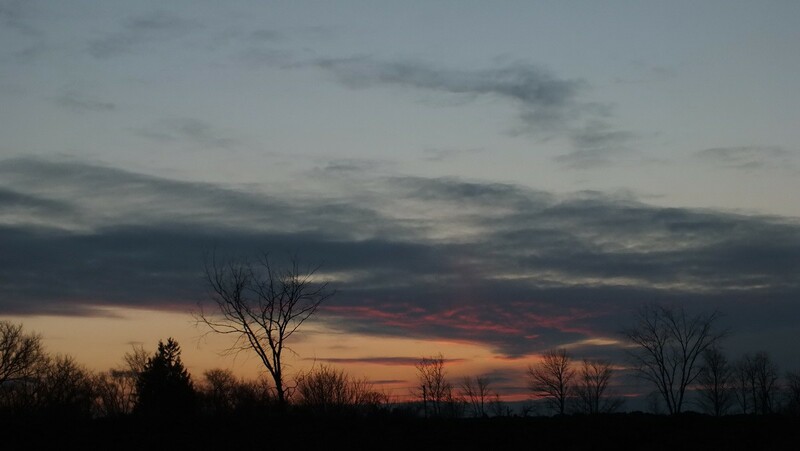 I have heard Great Horned Owls calling in the woodlot on our farm, but have yet to see one there. Since you sent us your feedback, we have actually been able to see a Great Horned Owl in Thickson’s Woods in Whitby. A pair resides in that forest, and as of last week, the female was sitting on her nest. I suspect that the babies will hatch soon. We have yet to hear any of the owls vocalizing. It must sound haunting. Thanks, Bob and Jean! 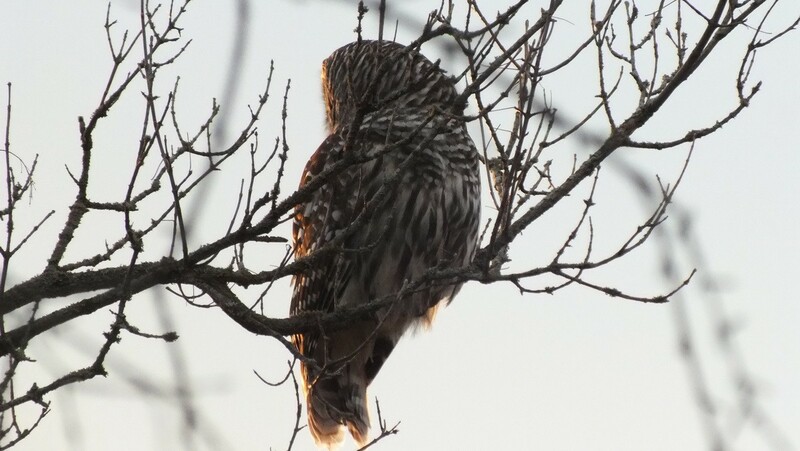 Liked the fact that you got pics of the back of the owl and its beautifully camouflaged feathers! Looking forward to looking at your other links. Thanks for your comments. We were very careful to let the lens do the work for us and to keep our distance. It was pretty cool to watch it hunt as it moved from tree to tree. The fact that it immediately pursued a ruffed grouse that suddenly emerged from the brush showed that it wasn’t wasting time on us but taking care of business. Very nice and lots of fun! 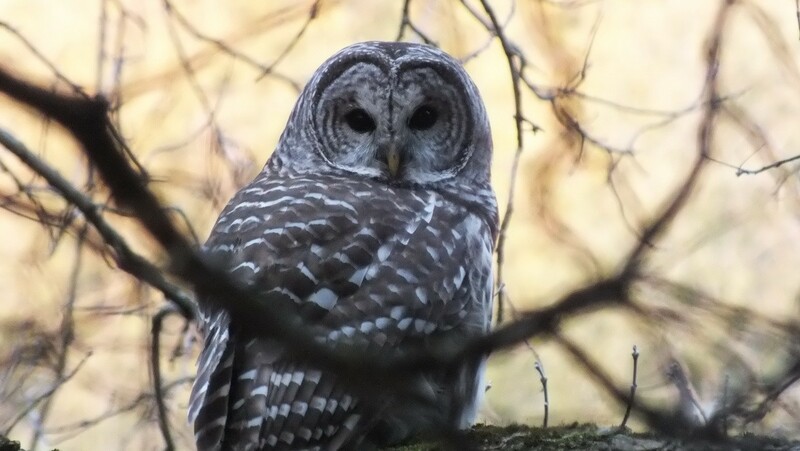 This year was the first time I had seen a barred owl too. I have actually seen three different ones…or at least I saw them in three different places…but all in Whitby. I know what you mean. How does one know if the owl they are seeing today is a different bird from the one they saw yesterday? 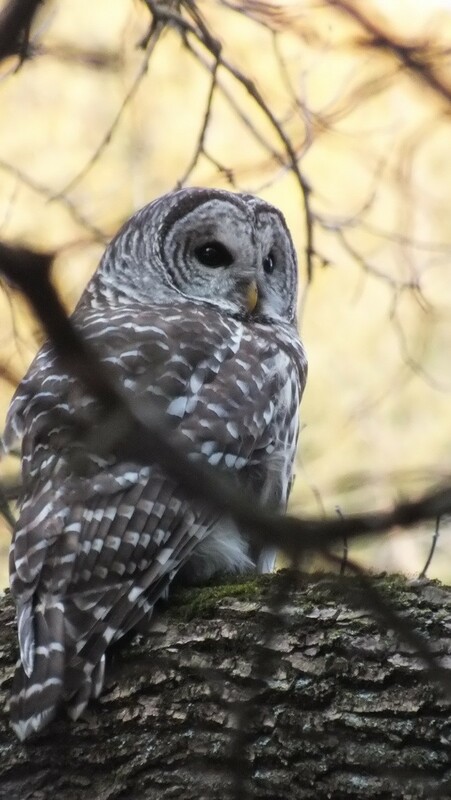 We actually spotted our second Barred Owl in Whitby, at Thickson’s Woods.